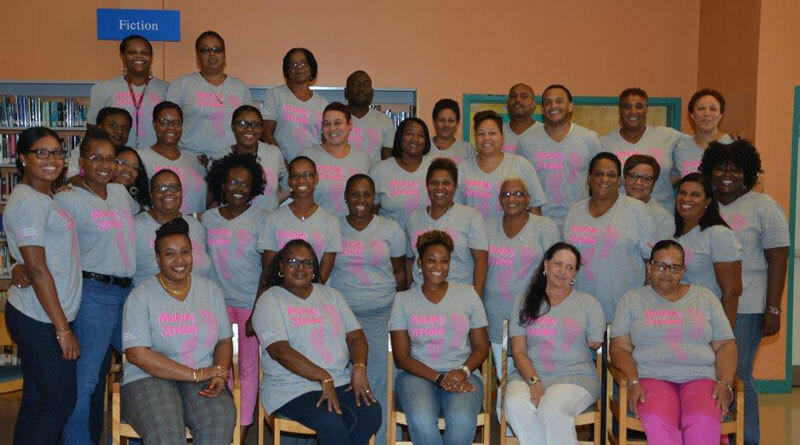 CedarBridge Academy kicked off the month of October by supporting Breast Cancer Awareness, with one third of the school’s staff purchasing t-shirts. Staff were invited to wear their shirts yesterday [Oct 1], with an additional Wear it Pink Denim Day today. “Mr. Duval Robinson spoke of the personal impact breast cancer has had on his immediate family. Students and advisers were shown photos of persons who have had some contact or relationship with CedarBridge Academy, and have either survived breast cancer or succumbed to the disease, including family members of former students, staff members, and others. “In an effort to raise funds, students have been invited to participate in the BF&M Breast Cancer Awareness Walk and Health fair at Barr’s Park. On October 21, CedarBridge Academy will offer their traditional breakfast, where teachers bring baked goods and staff donate funds, all in an effort to raise funds for Breast Cancer Awareness.